Assistant Professor of Biology and Environmental Studies Brad Oberle speaks at the Mosaic Nest at Robinson Preserve about an experiment his students conducted there. 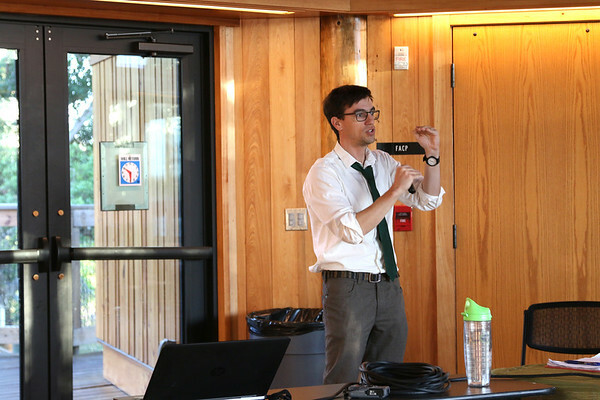 Community members gathered at Robinson Preserve to hear Assistant Professor of Biology and Environmental Studies Brad Oberle present the results of his carbon sequestration research. Oberle and students from his Forest Ecology Lab class worked on a worldwide research project last fall to study carbon sequestration in different habitats in coastal Manatee County. All the collected data can help scientists learn how much carbon is being released into the air, which can have an effect on climate change. They planted tea bags, which contain organic material, at various sites throughout the county and measured carbon decay by weighing the bags at the start of the experiment and again when they dug up the bags 90 days later. Although the habitats’ carbon consumption patterns aligned with their expectations, Oberle and his team still found unexpected results. It turns out the age of the habitat plays a role in carbon sequestration, regardless of habitat type. Older soil has a lower deposit rate than soil that was recently restored, and Oberle formulated a theory to explain the difference. Oberle delivered his remarks at the Mosaic Nest facility, a multi-purpose event space with 360° views of the preserve that is only open to the public during special events. Many who were in attendance, including preserve staff members, were also part of the corps of volunteers who helped the students plant tea bags at the start of the experiment. In addition to community volunteers, New College also partnered with the Sarasota Bay National Estuary Program, the Tampa Bay National Estuary Program, and Manatee County Parks and Recreation to conduct the experiment. Liz Lebron is associate director of communications and marketing at New College of Florida. How does a neoliberal obsession with making business fit for purpose impede progress in addressing climate change?